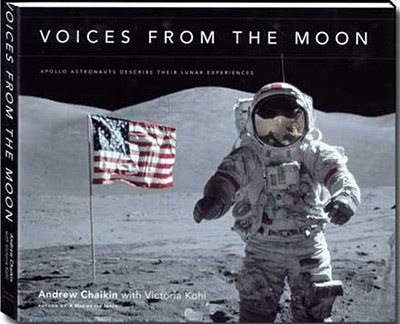 Voices from the Moon is another masterful work by Andrew Chaikin, author of 1994’s A Man on the Moon, which was the basis of the popular HBO miniseries, From the Earth to the Moon. For everyone who has ever looked at the sky and wondered what it was like to travel to the Moon, this book is a jewel to savor. This volume is a collection of carefully documented, selected, and organized interviews with twenty-three of the twenty-four Moon voyagers. Only Jack Swigert, who died in 1982, is missing. The author guides the reader into the story as the astronauts recount their formative years. Readers can easily relate to Jim Lovell, who wanted to be a rocket engineer and wrote a paper at the Naval Academy about liquid-fueled rockets, and to Pete Conrad, who took his first airplane ride at five years old, elbowing his way right to the front seat. What makes this book stand out over others are the spectacular high-definition photographs, which are expertly knitted to the words of the astronauts throughout the phases of the missions. Unlike many other photo histories, these images are precisely matched to the text page by page, leading the reader on a journey to the Moon and helping him or her to estimate the experience of walking on the lunar surface. Chaikin’s engaging interview questions prompt the astronauts to convey incredibly detailed descriptions of their missions. The astronauts vividly recall launch, translunar injection, and receding from the Earth as it diminishes in size. Perhaps some of the most thoughtful responses are of the Earth at lunar distance. Apollo 8’s Bill Anders said, “The biggest philosophy, foundation-shaking impression was seeing the smallness of the Earth… Even the pictures don’t do it justice, because they always have this frame around them… It’s not how small the Earth was, it’s just how big everything else was” (p. 159). Most of the astronauts who landed describe walking on the Moon as an experience that moved them in some way. Apollo 14’s Ed Mitchell said it was much like the simulations, “so there wasn’t anything you should’ve been terribly amazed at, except you were amazed at it” (p. 66). The command module pilots also give such vivid portrayals that the reader can imagine what the journey was like. Apollo 14’s Stu Roosa shares that in lunar orbit, “you feel that darkness. I don’t know how you feel darkness, but you do… And then a remarkable thing happens. You come around, and instantaneously it’s sunlight” (p. 111). The book flows smoothly through the chronological order of the missions and the astronauts provide succinct reflections on the Apollo program. Apollo 15’s Dave Scott summed it up this way: “Look at the system we had, and how well it worked. Not one single LM [lunar module] failure. Not one single backpack failure. Not one single rover failure… That’s magnificent! Nobody builds hardware and does that. Airplanes don’t do that. Nothin’ works that well… That’s the beauty of the program, I think, from the astronaut point of view. The association with the best people in the world” (p. 187). From training in the desert, to the solitary revolutions of seven command module pilots, to the search for the rim of Cone crater, Andrew Chaikin has created a masterpiece of words and images that is unparalleled. Voices from the Moon will not take up space on your bookshelf — you will want to leave it out to lure in family and friends. The photo sized book is still small enough to travel well in a briefcase or backpack for space enthusiasts to engage colleagues or strangers en route to work or school. This book is not just a first-hand history of the Apollo missions. It is a virtual journey to the Moon and back.